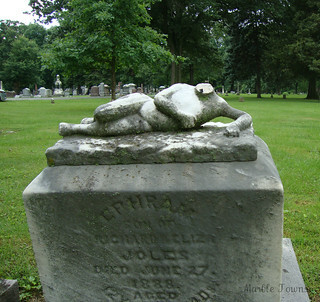 Alzina Niles Wing, wife of John Wing, is buried in the Walnut Hill cemetery in Baraboo, WI. 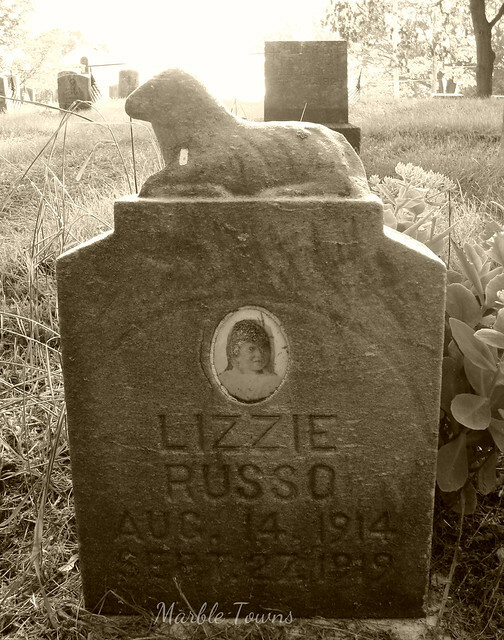 Looking for her on Ancestry, I found her death record, which indicated that she died on June 20, 1869 from “Schirus Stomach.” What’s that? Apparently, some kind of stomach cancer, from what I can tell. The 1860 census shows her as married to John Wing, age 53, and with two children, Hannah and Aaneth. By the 1870 census, John Wing is shown alone, with his occupational status as “at home,” (in 1860, he was listed as a farmer). 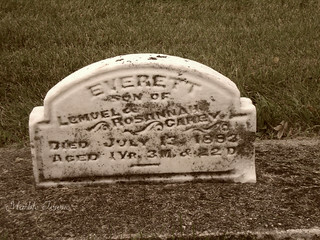 I didn’t take the best photo when I visited the Riverside Cemetery in Noblesville, IN. But I liked the eagle detail on the stone. Today, I tried to find out some information about this man … and I really didn’t get very far. 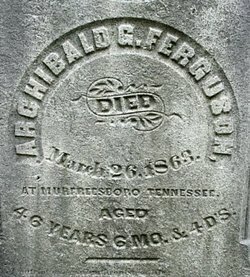 Between Ancestry and Find a Grave, I found that Archibald Glenn Ferguson was born in 1816 in Kentucky, and died on March 26, 1883 in Murfreesboro, TN. Here is a much better close-up photo of the inscription, courtesy of SunCacher on Find a Grave. 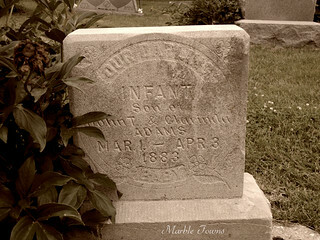 But I still wondered why, if this man died in Tennessee, why this stone is here in Indiana. And I couldn’t find any information at all. I did look to see if there were any Civil War battles in Murfreesboro and found that there was a particular ferocious one, The Battle of Stones River, which lasted from December 31, 1862 to January 2, 1863. 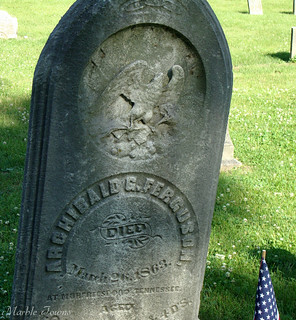 While I don’t know if Mr. Ferguson was there, it would make sense to me that he was — and I’m thinking that perhaps he died from injuries sustained in the battle. However, I still have no idea why he was brought back to Indiana (or at least, that this stone is here). I found her in some records, like the 1850 census, where she shows as Venetia Dose, the daughter of Walker and Susan Dose (one of 7 children). However, this is apparently not the correct spelling of their last name, which was Doores. 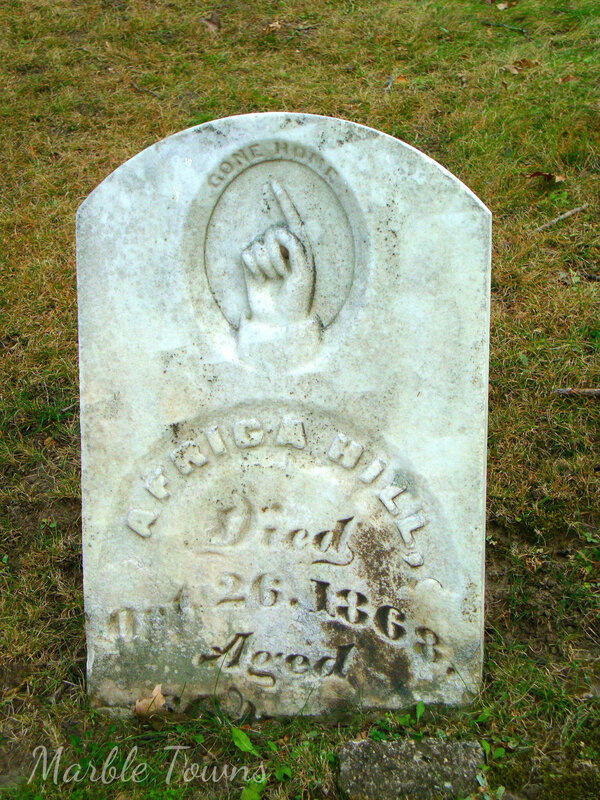 I found on Find a Grave that she was married twice, the second time to T.B. 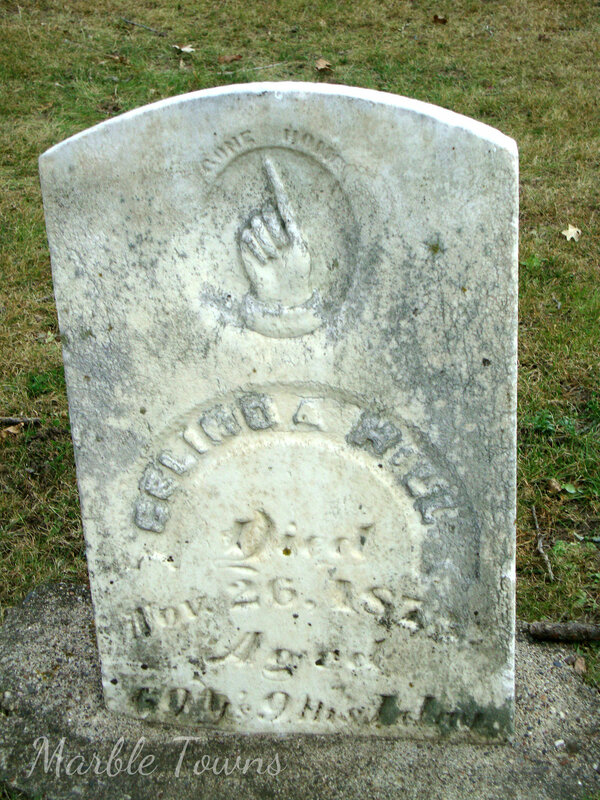 Rogers, who is listed on this stone. T.B. and Venetia (spelled Venesia this time) show on the 1880 census, where there are several children of theirs listed. Thomas shows as being born in Ireland, and is a farmer. 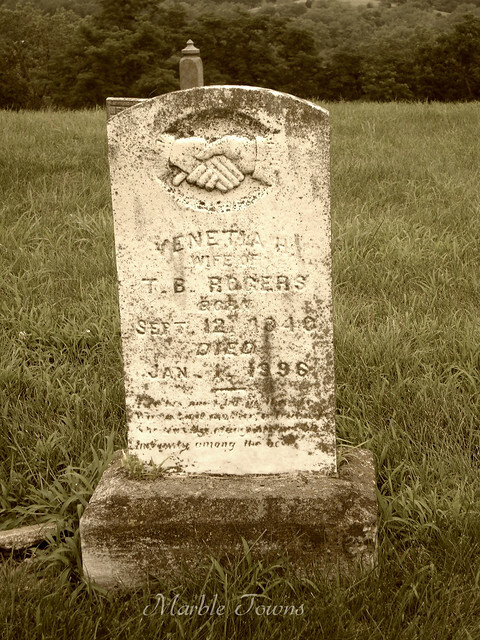 Farming was definitely part of Venetia’s life — the 1850 census shows her father was a farmer, and I’m thinking that perhaps Thomas was part of the farming community in this area of Missouri, as well. According to the information I found from the City of Lee’s Summit about the cemetery, Oliver B. Shepard robbed a bank and was shot by a vigilante posse. 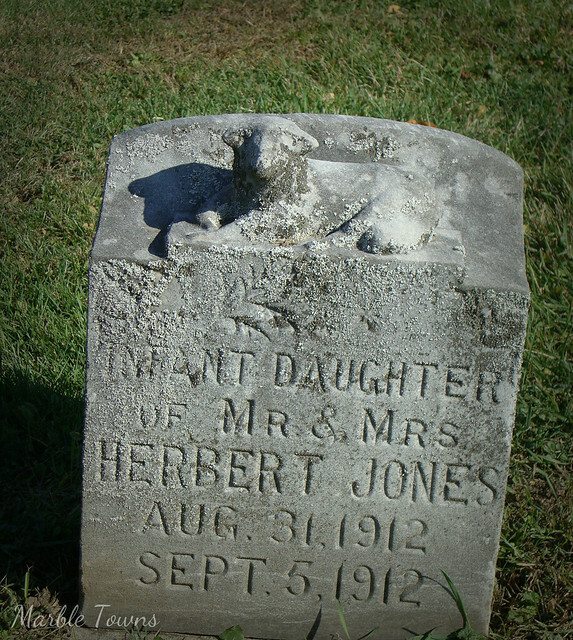 This grave is reputed to be the oldest burial in this cemetery. 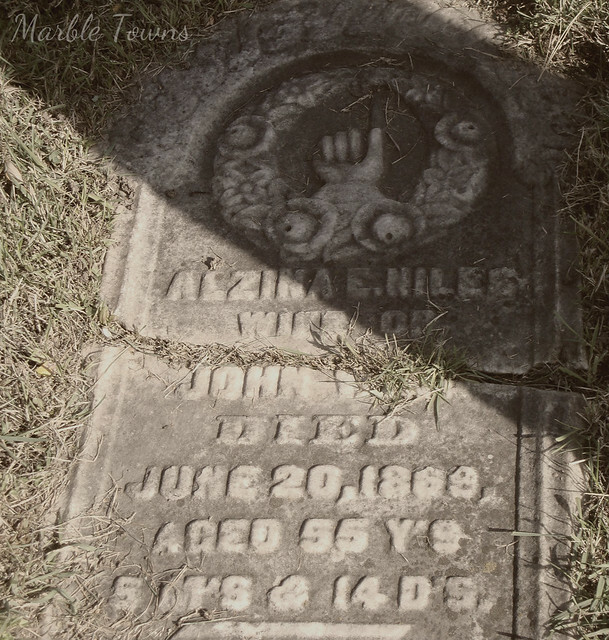 I found more information about this man here, which is really about the James Younger gang, but which mentions Mr. Shepard. Apparently, he was a member of a gang which included Frank James (yes, the infamous Frank James, brother of Jesse James). What I find interesting is that the stone here says “assassinated,” which makes me think that perhaps it was erected at the request of a family member. The fact that he was killed after robbing a bank (which was apparently just one crime that he was involved in) would make me think it would read “killed” on the stone. “Assassinated” gives a more sympathetic tone (at least, to me). Either way, the stone led me to learn more about not only this man, but of some of the history surrounding him.